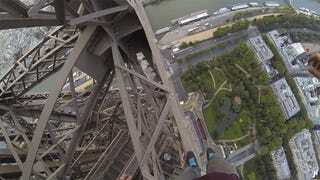 Ostensibly, the Eiffel Tower seems like a decent structure to climb. There are so many exposed parts that you could hold on to and so many paths to climb up that there’s no real wrong move. But then you realize, as you watch James Kingston scale the tower, that it’s actually a terrifying climb because every piece is so thin and the safe spaces are weirdly angled and that all that exposurein the tower actually makes you completely exposed. It’s frightening.